It’s no secret that the most popular course of the Minnesota North Shore’s scenic feast is Gooseberry Falls State Park: 1,682 square acres of public land along the banks of the Gooseberry River as it approaches and empties into Lake Superior near Highway 61 mile marker 39. Five waterfalls rush through glacial rock crevices within the park’s borders, drawing more visitors than the ever-popular Split Rock State Park a few miles up the shore. In 2014 alone over 630,000 visitors stopped to enjoy the falls and the surrounding hiking trails, picnic spots, and campgrounds. The first state park established on the North Shore, and the second-most-popular park in the state, Gooseberry’s history runs as deep as its natural beauty. The name has two likely origins. French explorers Pierre Esprit Radisson and his brother-in-law, Sieur des Medard Chouart Grosselliers, have long been considered the first men of European descent to explore the area, and Grosselliers is known to have been on the North Shore in the 1660s. “Grosseilliers” is French for gooseberry, so it could well be that Grosselliers named the river for himself. The local Ojibwe also had a name for this river, Shabonimikani-zibi or “Place of the Gooseberries River.” It would be quite a coincidence if a man named Gooseberry travelled half the world to discover a river that the native peoples were already calling “Gooseberry.” At the time Groselliers was on the North Shore, the Ojibwe had not yet reached Lake Superior on their long migration from the east, giving rise to the idea that the Ojibwe used the name given to the river by the French. From the time the French arrived until the 1850s, some fur trapping likely took place along the river’s banks, but like most natural formations, it lived a quiet life as far as historians are concerned. That changed after the 1854 Treat of LaPointe opened the “Minnesota side” of Lake Superior to settlement by U. S. citizens of European descent. Encouraged by large copper deposits found on the Keewana Peninsula of Upper Michigan, prospectors quickly made claims up and down the North Shore at the mouths of rivers and creeks, hoping to find large deposits of copper. One of those claims was the town site of Gooseberry, platted by Leander Palmer, Frank Hocker, and others. But like the dozens of other “copper towns” along the shore, the town was never developed because no copper deposits were ever discovered. After the Financial Panic of 1857, Gooseberry and every other north shore community except for Beaver Bay disappeared. Towns again began popping up along the shore after 1870, when commercial fishing was established to help feed Duluth’s growing population, but no one staked a claim at Gooseberry. Commercial logging reached the North Shore in the 1890s, and in 1899 the Superior Lumber Company purchased the land surrounding the river for $1 million. The company’s owners, including former Wisconsin Senator William Vilas, estimated the property contained 400 million board feet of timber. Within a year the Nestor Logging Company bought the Ashland mill and leased the land along the river for $1.25 million; the Superior Lumber Company’s profit of $250,000 would be worth about $7 million today. Nestor established rail lines to enable loggers to transport timber to the mouth of the Gooseberry River, where it was lashed into rafts and floated across Lake Superior to the company’s sawmill in Ashland, Wisconsin. Nestor Logging Company worked the land until 1909, the year it set a record for towing the largest log raft across Lake Superior. It took the tug Schoolcraft eight days to pull the raft’s 6,000,000 feet of logs to Baraga, Michigan. The captain of the tug brought along carrier pigeons along in order to be able to send for help in case of trouble. The cleared land sat unused until the 1920s, about the time when logging companies had exhausted the region’s timber supply. By then the state had begun building Highway One—today’s Highway 61—from Two Harbors to the Pigeon River. In 1922 the state built a bridge over the Gooseberry River near the falls. Concerned that the North Shore would become accessible only to the wealthy, the state purchased the property in the late 1920s from Vilas’s estate. Legislation passed in 1933 protected the property from development. It was classified as a scenic Game Preserve owned jointly by the Highway Department and the Department of Conservation and intended to operate as a public hunting ground and game refuge. In 1934 the U.S. Forest Service established Civilian Conservation Corp Camp 2710 adjacent to the river. Crews built the roads and trails, cleared logging slash, erected fire towers, and fought forest fires until the camp closed in 1941. The CCC erected over 80 structures in a distinctive rustic design using stone and wood found on site. The scenic views of the North Shore and the Gooseberry River with its waterfalls influenced the National Park Service to designate it as a state park rather than public hunting ground. 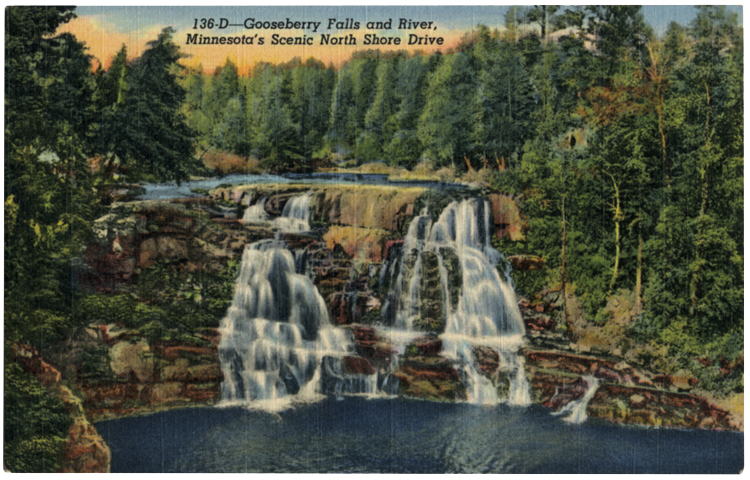 In 1937 Gooseberry Falls became the first state park on the North Shore. That same year the highway bridge was widened to handle increased traffic. Visitors walking along the massive stone retaining wall next to Highway 61 see lasting evidence of the work that helped our country’s economic recovery in the depths of the Depression. This wall and several other rustic structures in the park stand today as a reminder of hope in hard times and tell of the sheer physical labor that was required to construct them—mainly by manpower, with little help from machines. (Ingenuity helped: larger stones were lowered in place with a derrick crafted on site by blacksmith Pete Mertes.) The retaining wall, called the Highway Concourse and Retaining Wall and popularly known as the “Castle in the Park,” stands from 15 to 25 feet high and stretches for 300 feet along the highway adjacent to the bridge spanning the Gooseberry River. The massive structure is a work of stone art. The park’s stonework was completed under the supervision of Italian stonemasons John Berini and Joe Cattaneo, who trained the men who hauled, shaped, and placed the stones in their intended locations. It is thought that workers used a wire coat hanger to shape a template for the space available for the next stone, and workers would then find a rock that would best fit that template. Hand chisels were used to make a more precise fit. Architect Edward W. Barber of the New Deal era’s Minnesota Central Design Office oversaw the design of all of the structures in the state’s parks. Their similarity created unity throughout the state’s parks system, varied only by the type of stone available in each location. The dark granite used at Gooseberry comes from quarries near Beaver Bay while the red was mined near Duluth’s College of St. Scholastica. The logs were found in what is now Cascade River State Park between Lutsen and Grand Marais. Gooseberry’s rustic structures are known as some of the most outstanding examples of CCC work in the state’s parks. The variety of rustic structures scattered among the trees and along the lake shore speaks of both beauty and utility. They include a round stone water tower, a picnic shelter, a campground shelter, a pump house, an ice house, picnic tables, and fire grates. The last building constructed by the CCC, completed in 1939, was a visitors’ center called the “Refectory.” The building has been closed since mid-1990s, but plans are underway to reopen it as a memorial to the CCC workers, a fitting tribute to the men who built the park. The park’s boundaries have expanded over the years, more than doubling its size to 1,682 acres. In 1989 it was placed on National Register of Historic Places. In 1996, the new Visitor Center—designed by renowned Duluth architect David Salmela—opened near the falls. It contains an exhibit area, classrooms, and a well-stocked gift shop. Continuing the long tradition of using native materials, its fireplace is made of stone blasted between 1991 and 1994 to create Highway 61’s Silver Creek Cliff Tunnel. Today, only Fort Snelling State Park—wedged between the two largest cities in the state—enjoys more visitors.